Last week I shared with you the Swiss Chard Omelet from Cuisine Nicoise; the new cookbook from Hillary Davis. This week I want to share with you another great recipe from the book, Pasta Salad with Olive Pistou. 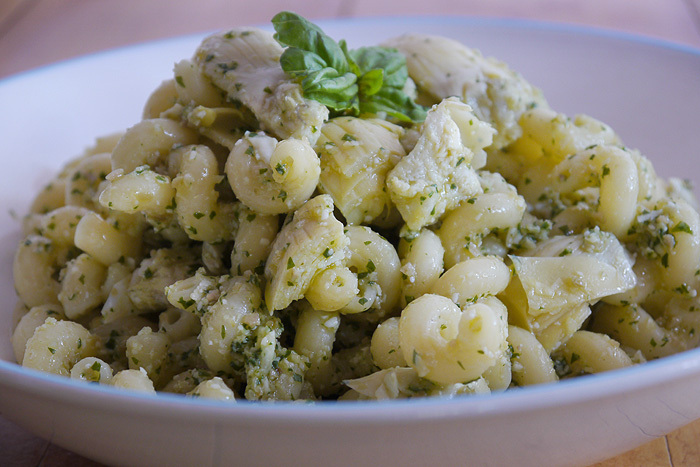 A pesto made from olives and basil adorns pasta and artichokes in this tasty salad. Serve cold as an accompaniment to grilled chicken or warm as a vegetarian entree...either way woks. To the bowl of a food processor, add the oil, basil, garlic, olives, lemon juice, and Parmesan. Process to a smooth consistency. Cook the pasta according to package instructions. Drain and immediately toss with the black olive Pistou, half of the pieces of chicken, and artichokes. Divide among four plates. Add the rest of the chicken on top if you would like big servings, or save to make sandwiches the next day. Slice the 8 basil leaves thinly and garnish each plate before serving. This salad can be refrigerated and served cold as well. Love the simplicity and flavors in Hillary's recipes. Looks scrumptious! Sounds like a perfect summer side dish! I bet the olives add that perfect pop of flavor! This looks like a perfect picnic option! I love that this can be served cold! Perfect for a picnic. That pistou sounds incredible. This looks like a great summer dish. Oh gosh, this would be perfect with grilled chicken!